Interesting that while there were some mega fund-raisings last quarter driving the total dollars invested, the total number of deals completed was also the highest for some time. Mobile funding hits record $7.8B In Q4’14, VC funding to the mobile sector topped $3B for the first time ever due to mega-financings to Uber, Snapchat, Instacart, and Square. 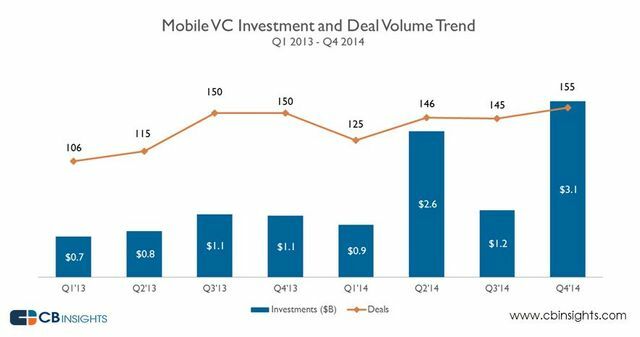 Overall VC funding to the mobile sector was up 109% versus 2013 driven by these mega-deals. Deal volume was up only 10%. The Uber impact was clear in the mobile numbers. Early stage investments at the Seed and Series A stage made up 70% of VC deals in the mobile sector as investors increasingly bet on the promise of mobile. But late-stage mega-deals saw 58% of funding going to Series D+ stages.